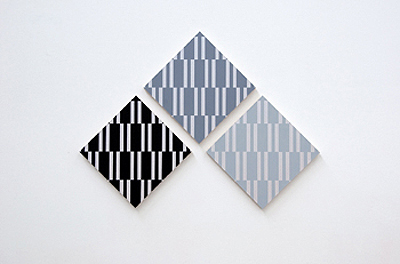 No Noise is a group exhibition of three international artists with three different conceptual approaches, brought together by the imposed scheme of Black and White. 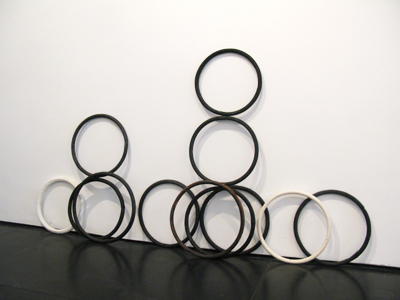 It is a response to strands within the artists' work, which reference minimalism, deconstruction and textual approaches as a method of creating works. By removing the element of colour from all their usual practices the show becomes a grid and the work within it a cipher. No Noise is the white noise of the analogue broadcast or the digital scramble, in which information is embedded and can be found if sought. 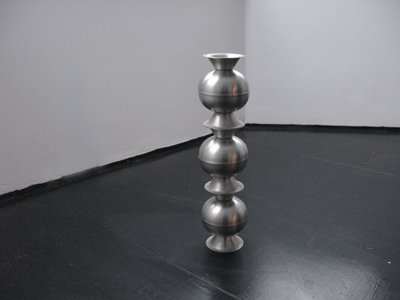 Kevin Hunt constructs sculpture utilising the redundant; particularly furniture, which is reconfigured into linear and increasingly minimal works that balance or are propped precariously. Placed in fragile equilibrium, these structures are often further undermined through transformative processes such as burning, resulting in darkly monolithic objects, mutably teetering on the edges of two and three dimensions. Elegantly scaling the height of the ceiling with their thin 'Brancusiesque' limbs these works playfully tamper with the poetics of the found form, exposing an inherent geometric beauty that has always lay within whilst questioning the capacity of such objects as they come to exist as sculpture. Dan Miller reworks the territory of ratio and repetition, where painting's sign-like vocabulary is disabled; superseded by a cipher. Symmetrical compositions of dots, lines and polygons float on an x/y axis, the grid providing a skeletal underpinning for pictorial and chromatic arrangement. 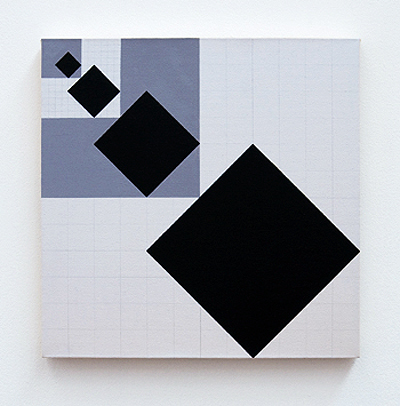 Painterly depth, created by barely visible layers of 'interference' acrylic, characterise Miller's two-tone works. 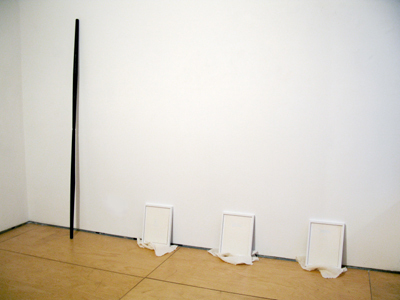 Through these acts of delineation Miller's work renders apparent a function of reading that exists between the production and reception of an artwork, a process defined by encryption and deciphering. Are Blytt takes on minimalism by removing painting entirely from the canvas, dyeing cloth to mimic the tonality of branded book covers such as the German sheet music company Henle. 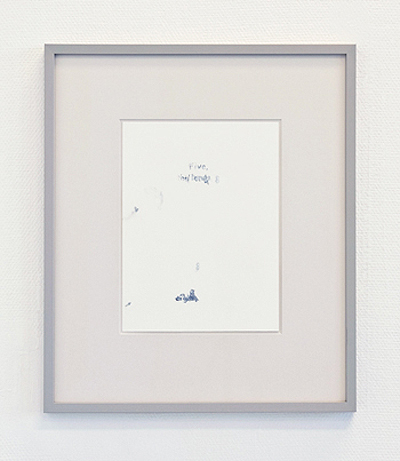 Discovering a new form of hedonism in this game of white on white, he creates white drawings in white frames on white sheaths of canvas, bearing only stains as message. Fascinated by logos and text, Blytt's work has abandoned the message and replaced it with a considered stutter, a conversational trace.